Hypothermia is a lowering of the body's normal temperature. 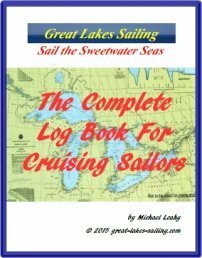 It is a serious threat to sailors because of the potential for going overboard. Also, the Great Lakes are cold lakes – Lake Superior's average summer temperature is 40F/4C. Long hours at the helm can leave a sailor exposed to spray and wind which can sap the body's heat. Water wicks away body heat 25 times faster than air. Significant hypothermia occurs when the body's core temperature falls below 95degF/35 degC. Severe hypothermia occurs when the body temperature falls below 90F/32C. All body functions slow down including mental acuity, heart rate, and breathing. If the progressive cooling of the body's core is not stopped, the body steadily begins to shut down, beginning at the extremities – all in an effort to preserve the core temperature necessary to stay alive. Speaking about hypothermia, both the Canadian Coast Guard and US the Coast Guard refer to the 1-10-1 rule. From time of immersion, you have 1 minute to get your breathing under control. Studies show that 20% don't and therefore die, breathing in ice-cold water in an uncontrolled panic, gasp, panic and then drown. 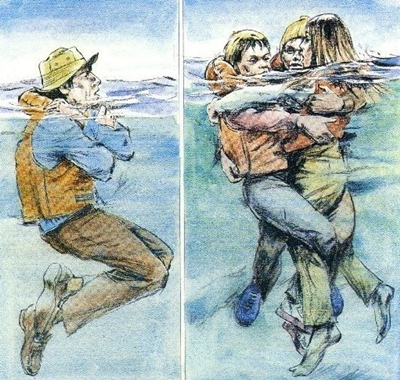 In some situations, the sudden immersion into cold water triggers a cardiac arrest. The next 10 refers to the 10 minutes of useable muscle control. Here is where swimming begins to fail. Without a lifejacket, here is where drowning will likely occur. The final 1 refers to 1 hour before hypothermia sets in. Note that if you don't have a lifejacket, you will likely not die of hypothermia as you will already have drowned. Be gentle. When giving hypothermia treatment, it is important to handle him or her gently. Limit movements to only those that are necessary. DO NOT massage or rub the person. Excessive, vigorous or jarring movements may trigger cardiac arrest as cold blood is forced back from the extremities into the heart. Move the person out of the cold (if possible) to a warm, dry, sheltered location. If you're unable to move the person out of the cold, shield him or her from the cold and wind as much as possible. Cover the person with blankets. Use layers of dry blankets or coats to warm the person. Make sure you also cover the person's head, leaving only the face exposed. Insulate the person's body from the cold. If you're outside, lay the person on their back on a blanket or other warm surface. Monitor breathing. A person with severe hypothermia may appear unconscious, with no apparent signs of a pulse or breathing. If the person's breathing has stopped or appears dangerously low or shallow, begin cardiopulmonary resuscitation (CPR) immediately. Share body heat. To warm the person's body, remove your clothing and lie next to the person, making skin-to-skin contact. Then cover both of your bodies with blankets. Provide warm, sweetened beverages. If the person suffering from hypothermia is alert and able to swallow, provide a warm, sweetened, non-alcoholic, non-caffeinated beverage to help warm the body. The sugar provides fuel for the muscles and aids in the body's ability to rewarm itself by shivering. Use warm, dry compresses. Use a first-aid warm compress (a plastic fluid-filled bag that warms up when squeezed), or a makeshift compress of warm water in a plastic bottle, hot water bottle or a dryer-warmed towel. Apply a compress only to the neck, chest wall or groin. DO NOT apply a warm compress to the arms or legs. Heat applied to the arms and legs forces cold blood back toward the heart, lungs and brain, causing the core body temperature to drop. This can be fatal. DO NOT apply direct heat. DO NOT use hot water, a heating pad or a heating lamp to warm the person. The extreme heat can damage the skin or even worse, cause irregular heartbeats so severe that they can cause the heart to stop.